https://imgur.com/a/wuwkSfu (Excessive revving) was told this is "Normal" when I emailed the video to a service tech. It is not normal. I've had the car for three months and the alcantara is already starting to wear. Any suggestions on cleaning? 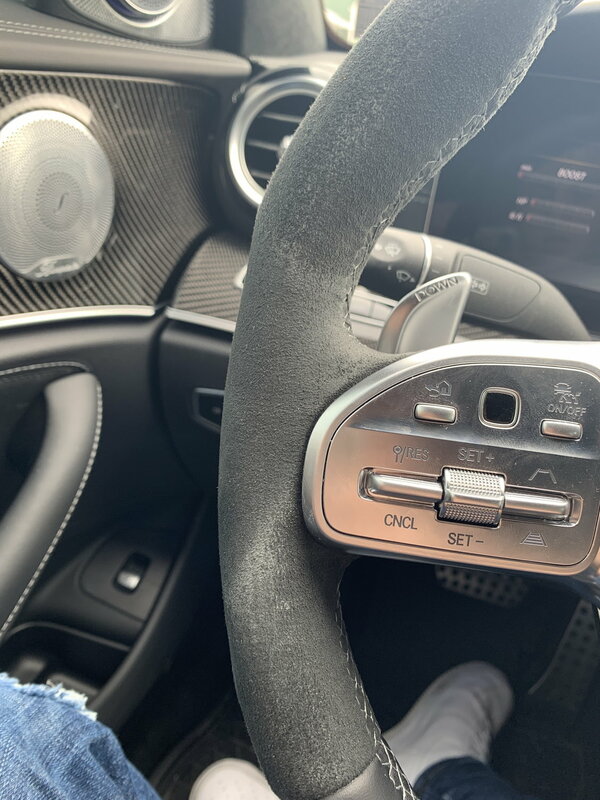 The wear seems a little excessive, are you wearing rings on your left hand and scraping against the alcantara? Last edited by bobblehead; 03-24-2019 at 09:03 AM. It defaults to comfort. I press the start button without pressing the brake, switch to S+, then start. No rings. Really don't understand it. It's normal to shoot up to 2500, sometimes 3500 RPM's randomly just because I start it in S+? Last edited by 19E63s; 03-24-2019 at 05:39 PM. I tried mine out a bunch of times at s+ on (warmed up) start, it goes to 2500 rpm ... not 3500 rpm at all. That's the problem. It only sometimes goes 3000-3500. Again this always happens randomly. Sometimes it starts normally. I don't think it should stay revving for 3-5 seconds. Just doesn't seem normal. Or starting in C and moving to S+ when the oil temp is no longer showing blue. I've tried to take a picture of my wheel and seems like it looks like the same on a picture )))))) But in real life much better.